Air travel did have a Golden Age. There was more space, classier interiors and bolder designs. You don't even have to go back to the 50s and 60s to see that. 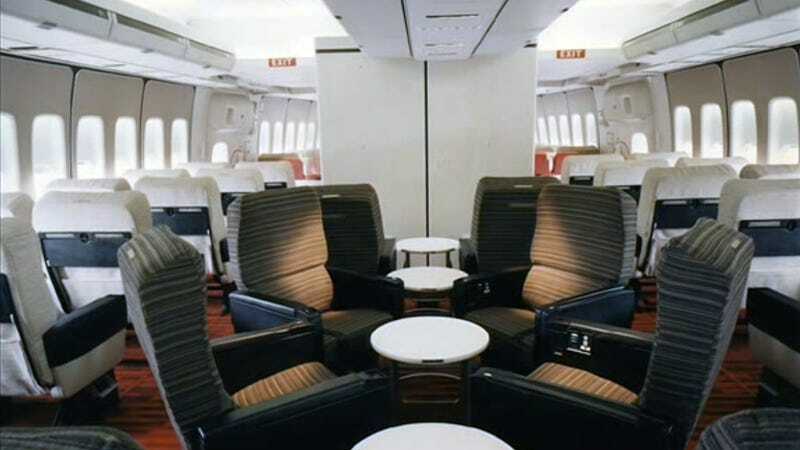 Here are some of the actual cabin interiors for the Boeing 747s in the 1970s. They are awesome. The idea of the Boeing 747 started in the 1960s, when Pan Am asked Boeing for 400-seat plane. Pan Am's chairman Juan Trippe had a flying ocean liner in mind, a double-decker jet. But the design team at Boeing didn't think this was a good idea. They favored a wide-body design because, back then, it made more sense from an engineering, economical, and safety point of view. The Airbus A380 changed this decades later. In part, you can say that it was us and our stupid carry-on bags that screwed airplanes. Even the storage areas looked like a scene from 2001 Space Odyssey.